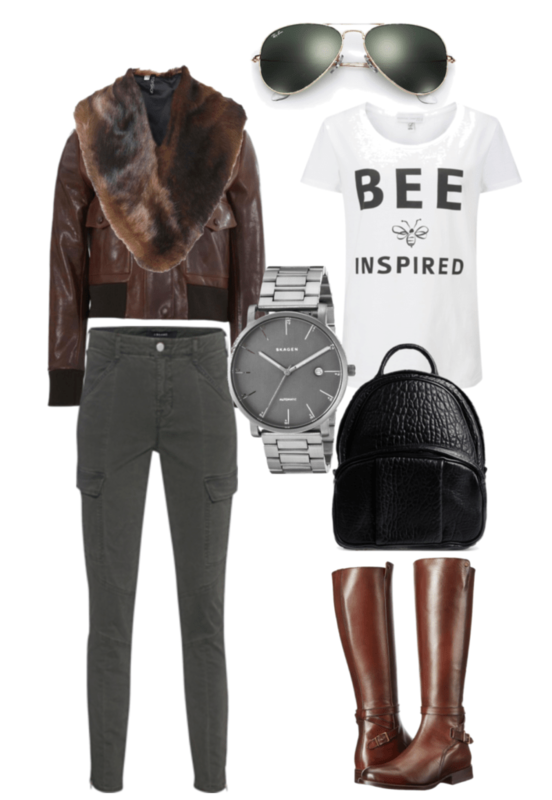 Minimalist Parisian Chic: Style and Outfit Remix Ideas – Rugged Aviator | Save. Spend. Splurge. Today I thought I’d tackle the Classic Aviator Look which consists of at least a bomber jacket, a strong watch, rugged boots and some aviator sunglasses, but twisting it into something a bit more modern, and then ladylike. Do let me know if you like this! If so, I’ll make it a new series called Outfit Remix. It’s a classic base of a t-shirt, jeans and boots, a leather jacket topper and a pair of aviator glasses as the base, but with subtle twists all over the place! Adding in a faux fur stole for some elegant chic, the boots have a pretty knotted ankle detail, the pants are not plain jeans but cargos with zippers and cool flat pockets for style (not to be filled with things! ), all off set nicely by a strong gunmetal men’s watch (to keep it from getting too matchy-matchy with the brown) and the most classic of all aviator pieces — the bomber jacket & the glasses. The last quirk in the whole look? That leather backpack, in black, slung over the shoulder, prepared for anything and yet still comfortable. 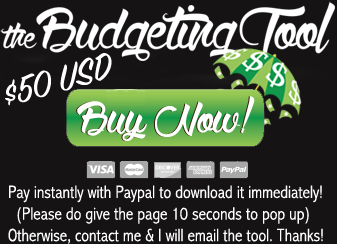 Switch out the boots for some high heels [ Go Leopard Print, Splurge, Spend or Save ] and change the backpack to a clutch [ Vegan, Splurge, Spend or Save ]. Change the boots to pointed flats [ Go Leopard, or Metallic Rose Gold, Vegan, Splurge, Spend or Save ], remove the faux fur and add an oversized scarf instead [ Vegan, Splurge, Spend or Save ] and add a leather hobo bag instead of the black backpack [ Vegan, Splurge, Spend or Save ]. It softens the classic aviator look and refines it with a few details that make it more ladylike, if you will. By adding the skirt instead of the cargo pants, making the t-shirt a silky camisole instead, and changing out the black backpack for a chic bucket bag instead, it changes the tone of the whole outfit to something a little girlier. The finishing touches are all in rose gold from the aviator sunglasses to the watch, but the brown aviator bomber jacket with the boots keeps the rugged charm intact. If you don’t plan on keeping your bomber jacket on, then add a black sweater to cover the shoulders of the silky camisole so you are still work-appropriate [ Splurge, Spend, Save ]. If you aren’t thrilled about the whole look as being too casual for the office, then switch out the leather bomber for a leather blazer [ Vegan, Splurge, Spend, Save ], and make the boots into heels instead [ Go Leopard Print, Splurge, Spend or Save ]. P.S. You can read my other posts for inspiration: How to get a Parisian fashion wardrobe, or an Ideal Chic Minimalist Parisian Look. If you liked this, let me know and I’ll create more Outfit Remixes. ← Wandering into the unknown. Great outfit ideas! Do you use clothes from your own closet for the pics? For as much as I can, yes!